Join me Saturday, November 7th, from 11 - 6, for the second annual Make + Take Trunk Show at Art Star! 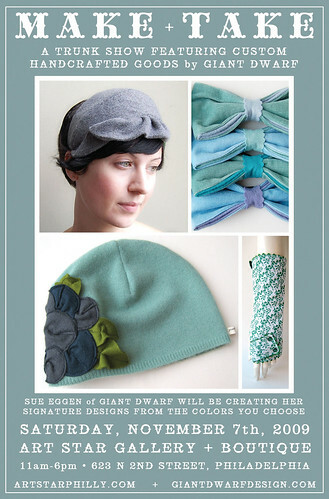 I'll be setting up shop, in the annex of the boutique, with lots of Giant Dwarf goods, but there's a twist. I'm bringing my sewing machine and I'll be creating my signature designs from the colors you choose. Oh, and there will be mimosas and plenty of snacks, so bring your best pals and come on down. I'd love to meet you and make something special just for you! Art Star is located at 623 North 2nd Street, just one block north of Spring Garden.